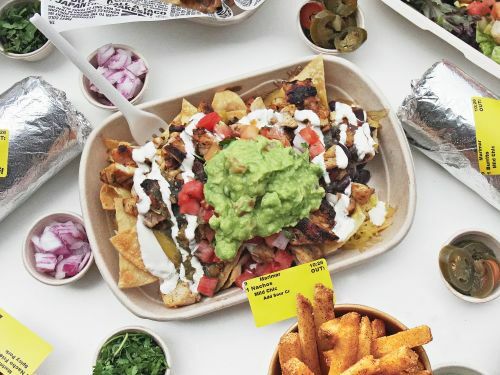 Menulog delivers for Guzman y Gomez - Top Ryde so you'll be able to track your courier on a map. Make it a Meal includes Fries and a Drink. With rice, Jack cheese, vegetarian black beans, salsa, and filling of your choice. Rolled in a flour tortilla. With rice, Jack cheese, vegetarian black beans, salsa and filling of your choice. Rolled in a flour tortilla. With rice, Jack cheese, vegetarian black beans, salsa, and filling of your choice. Served with GYG's corn chips. With rice, Jack cheese, vegetarian black beans, salsa and filling of your choice. Served with GYG's corn chips. With your choice of filling, topped with Chipotle fries, Cheese, sour cream, Pico de Gallo and Guac. A regular burrito with your choice of filling topped with chipotle fries, cheese, Pico de Gallo and Guac. GYG's corn chips, melted Jack cheese, vegetarian black beans, salsa, guacamole, and filling of your choice. GYG's corn chips, melted Jack cheese, vegetarian black beans, salsa, guacamole and filling of your choice. GYG's skin on, real potato fries, melted Jack cheese, salsa, with the filling of your choice, topped with sour cream, Guacamole and pickled jalapenos for spicy. GYG's skin on, real potato fries, melted Jack cheese, salsa, with the filling of your choice, topped with crema, guacamole and pickled jalapenos for spicy. With sauteed vegetables, vinaigrette, sour cream, rice, Jack cheese, vegetarian black beans, salsa, and filling of your choice. Rolled in a flour tortilla. With sauteed vegetables, vinaigrette, crema, rice, Jack cheese, vegetarian black beans, salsa and filling of your choice. Rolled in a flour tortilla. With sauteed vegetables, vinaigrette, sour cream, rice, Jack cheese, vegetarian black beans, salsa, and filling of your choice. Served with GYG's corn chips. With sauteed vegetables, vinaigrette, crema, rice, Jack cheese, vegetarian black beans, salsa and filling of your choice. Served with GYG's corn chips. Mixed greens, corn, cucumber, Pico de Gallo salsa, GYG's vinaigrette, and filling of your choice. Mixed greens, corn, cucumber, Pico de Gallo salsa, GYG's vinaigrette and filling of your choice. With rice, Jack cheese, vegetarian black beans, salsa, and filling of your choice. Rolled in a flour tortilla and topped with salsas melted Jack cheese, sour cream, guacamole, and GYG's corn chips. With rice, Jack cheese, vegetarian black beans, salsa and filling of your choice. Rolled in a flour tortilla and topped with salsas melted Jack cheese, crema, guacamole and GYG's corn chips. Mexican street style with salsa, filling of your choice and a lime wedge. In a soft shell tortilla. Mexican street style with salsa, filling of your choice and a lime wedge. In a hard shell tortilla. Hard tacos are served with Jack cheese. Grilled soft tortilla, melted Jack cheese, salsa and filling of your choice. A regular Burrito with your choice of filling, topped with chipotle fries, cheese, pico de gallo and guacamole. With sauteed vegetables, vinaigretta, sour cream, rice, Jack cheese, vegetarian black beans, salsa, and filling of your choice. Rolled in a flour tortilla. With sauteed vegetables, vinaigretta, crema, rice, Jack cheese, vegetarian black beans, salsa and filling of your choice. Rolled in a flour tortilla. With sauteed vegetables, vinaigretta, sour cream, rice, Jack cheese, vegetarian black beans, salsa, and filling of your choice. Served with GYG's corn chips. With sauteed vegetables, vinaigretta, crema, rice, Jack cheese, vegetarian black beans, salsa and filling of your choice. Served with GYG's corn chips. With rice, Jack cheese, vegetarian black beans, salsa, and filling of your choice. Rolled in a flour tortilla and topped with salsas melted Jack cheese, crema, guacamole and GYG's corn chips. GYG's skin on, real potato fries topped with signature chipotle seasoning and Queso cheese. GYG's skin on, real potato fries topped with signature chipotle seasoning. GYG's blend of creamy melted cheese and vegetable pieces optionally served as mild by topping with Pico de Gallo or spicy with Pico de Gallo and fresh jalapenos. Churros rolled in cinnamon sugar and served with GYG's Dulce de Leche. Lift, Sprite, Coke or Coke No Sugar. Sprite, Coke or Coke No Sugar. Mandarin, Cola, Guava or Lime. GYG's corn chips, melted Jack cheese and filling of your choice. Rice, Jack cheese and filling, rolled in a flour tortilla. 1 x cheese and 1 x cheese and filling. GYG's corn chips, melted Jack cheese and filling of your choice, with Carrot Discs or Kids Fries and a Water. Rice, Jack cheese and filling, rolled in a flour tortilla, with Carrot Discs or Kids Fries and a Water. 1 x cheese and 1 x cheese and filling, with Carrot Discs or Kids Fries and a Water.